Arborists are often called upon to assess and work toward resolution of structural defects in trees. It is often not possible to completely eliminate these defects, but there is a variety of strategies available to mitigate risk posed by them. At Out on a Limb we strive to rectify most structural issues by making intelligent, proactive pruning decisions. In many cases however, pruning isn’t enough to achieve an acceptable level of safety and other techniques like cabling, bracing or very occasionally propping need to be used. In most cases, cables are installed in trees that are likely to hurt people or damage property if there is a large branch or stem failure. In the industry we say that hazard is defined by target: a tree that is falling apart all by itself in the middle of a field is not likely to pose much risk and is typically a poor candidate for cabling, while a tree that grows close to a house or whose canopy extends over a public gathering space could be a good candidate for a cable even if the likelihood of branch or stem failure is relatively low. Even though there are many manufacturers of tree cabling systems, tree cables always fit into one of two categories which have different applications: dynamic cables and static cables. Dynamic cables are made of braided nylon rope or synthetic bands, and static cables are made of steel. Dynamic cables, which are made of relatively elastic material, have some advantages over traditional steel cable systems. Two important advantages are 1) they are non-invasive so they don’t create injury when installed, and 2) they allow the tree to move in a more natural way. Trees are self-optimizing biological systems, meaning they respond to their environments and utilize resources to grow stronger based on that input. Dynamic cables, if installed properly, do not inhibit this intelligent growth because they allow the movement that is a large part of environmental feedback. 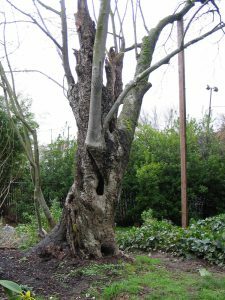 Because they allow movement, though, they should not be used to secure sections of trees that are in active failure or to reinforce weakness due to decay. Properly installed cables are placed two thirds of the distance from the compromised union to the top of the tree. At this height the nylon rope is wrapped around the stem and spliced back into itself. Areas of the trunk where the cabling system contacts the tree are protected with sheathing and a rubber bumper is inserted into the middle of the rope to further dissipate loads during periods of high wind. Dynamic cables reduce extreme movement in tree canopies during bad weather, thus reducing the risk of branch or stem failure. The splices in dynamic cables are designed to open up as the tree grows so that there is no threat of girdling (ie restricting the function of the tree’s vascular system by tightly encircling the bark), but they can not always be relied upon. One drawback of these types of systems is that they need to be inspected every 2-3 years, so there is a continued maintenance obligation for the homeowner. A second drawback is that dynamic cable systems, because of the nature of the material, have a shorter useful life than steel (invasive) systems. Manufacturers warranty dynamic cabling material for 8-12 yrs, after which point the cables become worn or weakened by ultraviolet radiation and must be replaced. The cost of inspection is minimal however and the inspections are very important. The braided nylon rope of the cable occasionally gets picked at by birds or chewed on by rodents and in some cases the splices can fail to open up. If cables are not inspected and this malfunction is not resolved, it can lead to girdling the trunk and killing the portion of the tree above the malfunctioning splice. Since trees will continue to grow, cables in most cases will eventually need to be removed and reinstalled higher up in the canopy to retain the optimal two thirds height. It is always important to remember that no amount of pruning or cabling translates to a 100% guarantee against tree failure, and a tree with any type of artificial support system will need to be monitored and assessed for the rest of its life. 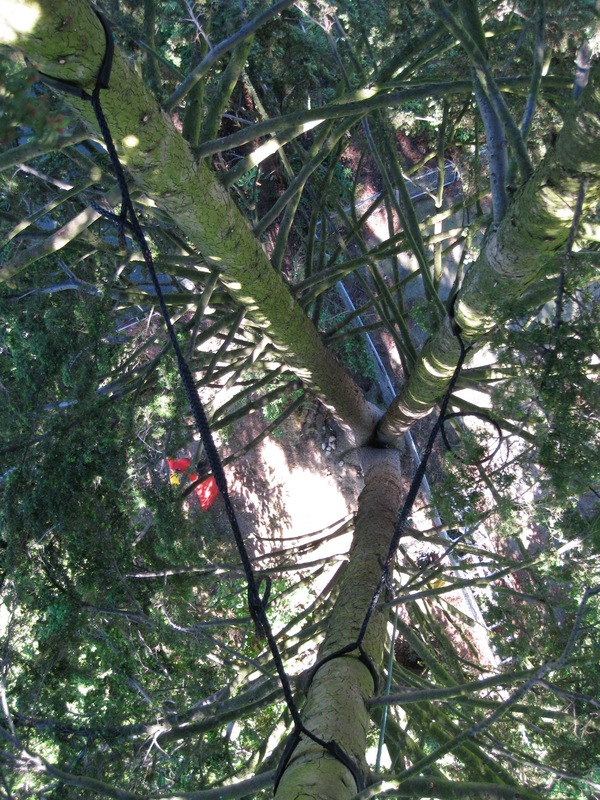 Trees with active failures or decayed sections that need to be supported are better protected with steel cables. These cables become permanent features of the trees they live in, though again as with dynamic cables another system will likely need to be installed eventually higher in the canopy to retain the optimal two thirds height. Steel cables are installed by drilling a hole all the way through the trunk and then inserting a threaded rod into the hole. The rod is secured with a washer and a nut that rests against the tree’s vascular system, just underneath the bark, on the backside of the stem. An eye nut or amon-eye (drop forged eye nut) is fixed to the rod on the inside face of the trunk and the steel cable is attached to the amon-eye using hardware called a thimble and a dead-end grip. The other end of the steel cable is anchored in the same manner to the other stem being reinforced. Steel cables are intended to prohibit movement at the compromised union. As the tree grows and puts on girth it is normal for the tree to grow over or “swallow” the hardware that is holding the cable in place, which is fine. Obviously the installation of steel rods requires wounding the tree, but because the holes are relatively small and bored straight through the heartwood, not much of the tree’s vascular system is disturbed. Most trees adapt to their steel cables and the accompanying hardware seamlessly provided the systems are properly installed. Despite their strength, steel cables are not a 100% guarantee against tree failure. In fact, steel cables are only installed in trees with identified significant defects. Trees with steel cables in them still need to be inspected and pruned on a regular basis. If a tree has a union that is in the process of splitting apart, a brace may be used to secure the union in conjunction with a cable. 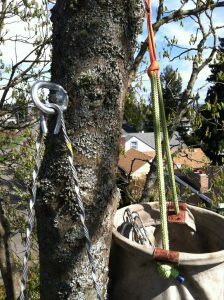 Bracing can be thought of as bolting a tree together and the braces are installed similarly to the steel cables, minus the actual cable. A hole is drilled all the way through the defective union and a threaded rod is inserted into the hole. The rod is secured on both sides with washers and nuts that rest against the tree’s vascular system just underneath the bark. Larger diameter trunks and branches may require several rods to properly manage and distribute the load. Braces, like steel cables, become a permanent feature of the tree. It is entirely possible for a young tree with a brace in it to swallow all evidence of the brace’s existence, yet the hardware still exists inside the wood and still works to hold the tree together. When installing bracing, industry best management practices require a cable also be installed to add further support to the compromised union. 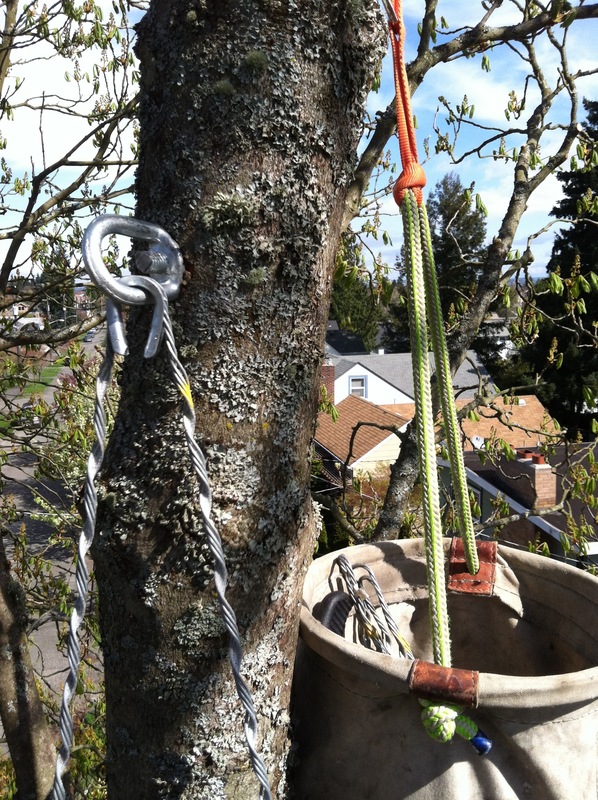 At Out on a Limb, we make a determination in these cases as to whether we install a steel or synthetic cable above bracing, depending among other things on the age, species and configuration of the tree. It is important that trees with cables and/or braces are inspected on a regular basis and that the existence of the brace within the tree is well-documented for the safety of arborists who may be called upon to prune or remove the tree in the future. Prop (16 ft pressure treated 4×4) holding up the remaining live trunk of an ancient mountain ash. Ten years later the main lead has failed but the young root suckers on the left are 20 ft tall and attached to a fantastic old hollow trunk providing tons of habitat. In extreme cases, some trees that are in the process of decaying or falling over can be retained if supported with props or guy wires. Since trees that are in the process of falling down are inherently dangerous, these tactics are typically reserved for trees with special significance or value. How a prop is constructed and installed is different in every situation. If a prop is installed in a tree, over time the tree will become incapable of handling the loads of increased growth without the prop: once a prop has been installed it must be maintained as the tree depends on its support. 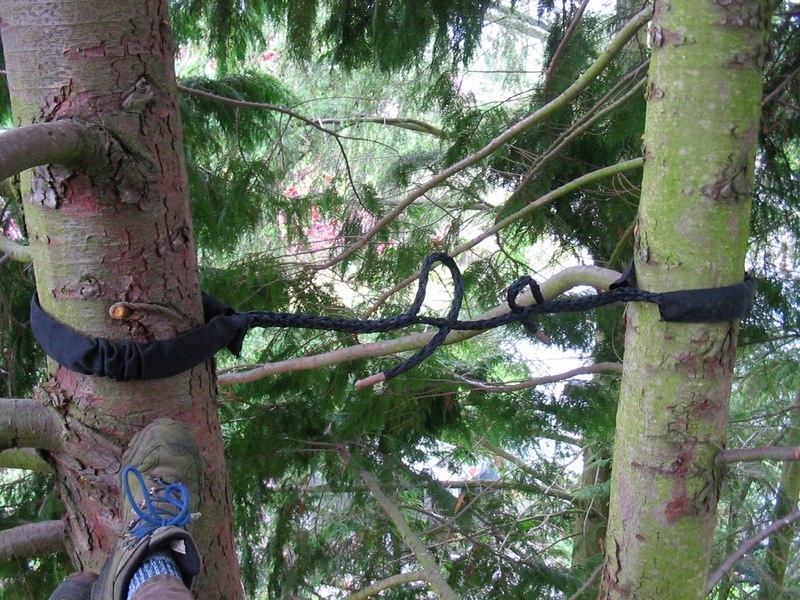 Guy wires can be useful for securing trees that are young or have been recently transplanted. These wires should be removed once the roots become established.